Bruce Thomas, long-time Cave Creek resident, known by everyone as Bubba, went to be with the Lord on November 27, 2018. He passed away peacefully after complications from surgery with family, friends and Patty, his loving wife of 25 years – who he always referred to as “Miss Patty” – by his side. Bubba was a proud member of Sons of the American Legion and American Legion Riders in Cave Creek. He loved to ride his Yamaha around town and to ride his horse Cody on the trails of the Tonto National Forest. 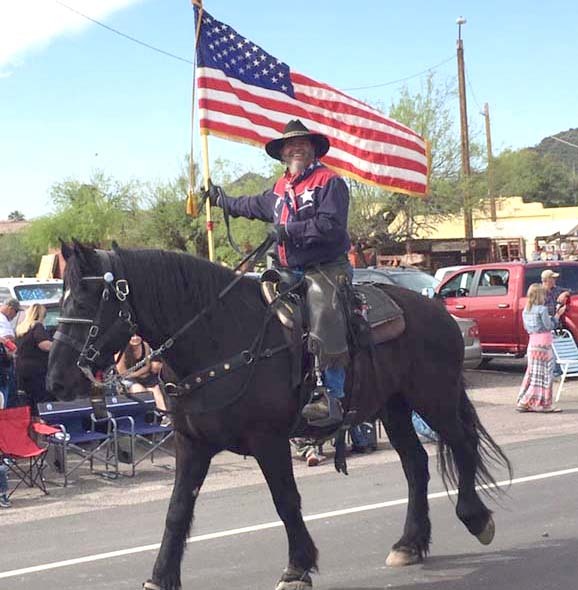 A great patriot, he served as Color Guard in many parades through Cave Creek by riding in front carrying a huge American Flag. Over the years, Bubba continually volunteered to help those in need, especially Veterans. A giving friend, he was the guy at the barbeque always willing to do the grilling. Bubba will be remembered by friends from coast to coast for his warm smile, infectious laugh and bold presence that filled every room he entered. His extended family from ALR, Brix and the horse community who loved him deeply will miss him profoundly. Besides Miss Patty, He is survived by two sons Josh (wife, Amber) and Jeremy (wife, Kim); five grandchildren, Cody, Cierra, Adelynn, Haley and Corbyn; his siblings, Ann, Patrick, Barbara and Brenda, as well as in-laws, nieces and nephews. He was predeceased by his parents. A celebration of his life will be held Friday, December 7 at 2:30pm at Carefree Church, 5025 E Carefree Hwy, Cave Creek, AZ. Bubba would have called this his Final Final. In Lieu of flowers please consider a donation to Marine Raider Foundation or the Salt River Wild Horse Management Group – two causes near to his and Miss Patty’s hearts.